Are you a modern classic fan? Do you fancy the sporty performance of Triumph’s Thruxton 1200, but like the style and relaxed riding position of something like the Street Twin – the Hinckley firm’s best-selling modern classic? Well, the new Speed Twin could be the bike for you. What is the Bonneville speed twin all about? Costing just £10,500 and with a name inspired by the original Edward Turner-designed 1938 Speed Twin, Triumph has taken the engine and chassis from the sporty Thruxton, shed 10kg and made it more comfortable. To achieve that affordable price tag the Speed Twin’s suspension and brake spec isn’t as sky high as the Thruxton’s and it doesn’t have such an array of design touches as the popular café racer. But don’t worry because everything about the Speed Twin works beautifully and it still comes with a high level of standard equipment: Brembo brakes, ABS, switchable traction control, three riding modes, LED lights, a torque assist clutch, USB charging socket, and immobiliser, Pirelli Diablo Rosso 3 tyres, a Monza fuel cap, bar end mirrors and a minimalist rear light. Front and rear mudguards, throttle body covers, side panel finishers and exhaust headers are all from brushed aluminium. Two-tone paint will cost you £300 extra. And if you’re hungry for even more goodies, there are over 80 custom Speed Twin accessories available from your dealer. How does the Bonneville Speed Twin differ from the Thruxton? 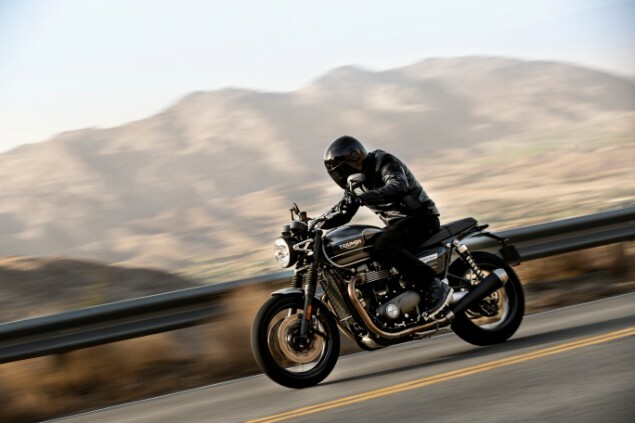 Stiff, cramped in the legs and heavy on the wrists, the Thruxton isn’t the kind of bike you’d want to spend all day on, but the Speed Twin is a much more cossetting proposition. A new 807mm high bench seat features air channels and 10mm more padding, footpegs are 4mm lower and 38mm further forward and bars are high and wide. Add that all together and you’ve got a fast Triumph that’ll be a breeze to be ride all day. 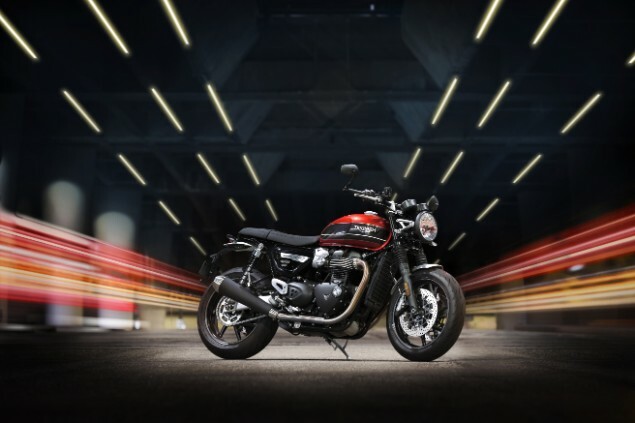 As part of its weight loss program, Triumph has modified the Thruxton’s tubular steel frame with a new subframe and a front aluminium cradle. 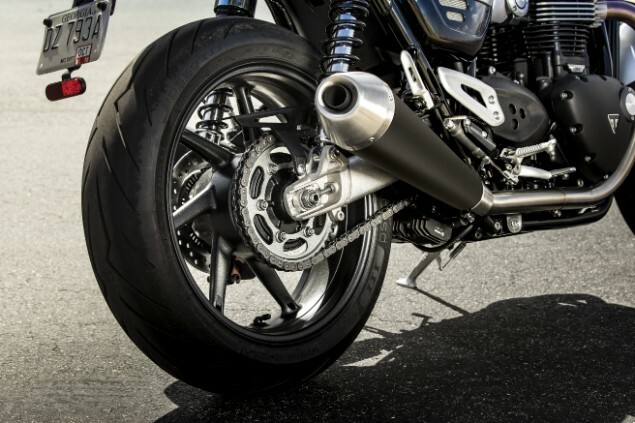 The Speed Twin also wears new cast aluminium wheels, which, together with the lighter clutch (new basket and gear), significantly reduces inertia and actually needs less steering input than the Thruxton. Right way up forks and twin rear shocks might lack adjustment and wow factor, but the KYB suspension soaks up bumps nicely, giving you a smooth ride when you’re taking it easy and control when you’re pressing on, but the forks can feel under damped when you turn up the wick. Brembos aren’t radially mounted or hewn from a single block, but they’re still quality items and thanks to its four-pad design they’re powerful and full of feel. 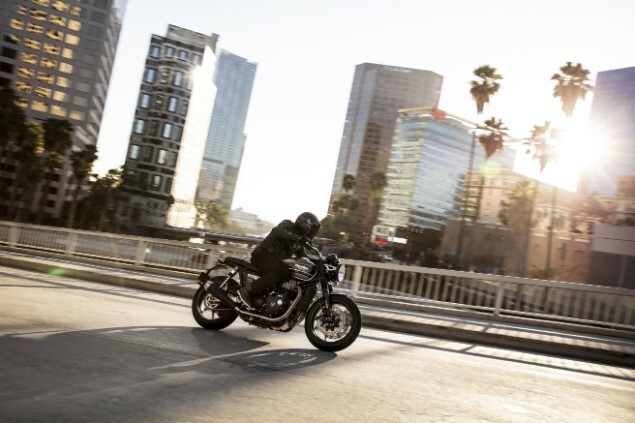 Just like the sportiest of Hinckley’s modern nakeds, like the Street and Speed Triple, the Speed Twin exudes that same trademark easy balance and fun handling. Triumph say the chassis works so well there won’t be a more expensive R version, but how nice would the Speed Twin look with the Thruxton R’s radial Brembos and Ohlins? What about that 1200cc engine? The final piece in the weight saving puzzle comes in the shape of the 96bhp Thruxton-tuned 1200cc ‘High Power’ motor, which is 2.5kg lighter, thanks to its revised clutch assembly, mass optimised engine covers and magnesium cam cover. Packed with grunt, the parallel twin makes over 75ftlb of torque (and a maximum of 83ftlb@4950rpm) from just over 2000rpm and stays there for the meat of the rev range. You don’t need to keep the engine on the boil to make swift progress, just keep it in the high gears, savour the acceleration and let the roar of the pipes wash over you. Power delivery is chunky and smooth, but the throttle can be snatchy through town and in slower corners. In the same way a powerful naked is easier, more fun and involving on the road than a sportsbike, the Speed Twin makes much more sense for every day riding than the Thruxton. Rivals include the BMW R nineT Pure and Kawasaki Z900RS – both brilliant and priced around the same as the Speed Twin, but the Triumph has the edge when it comes to performance, refinement and spec level. Triumph has succeeded in creating a classy retro roadster at a price that won’t break the bank. A lack of wind protection rules it out of big motorway runs, but the Speed Twin will be perfect for long Sunday morning, trips to the coffee shop and lots of smiles in between.